Creative Team Member Barbara Anders spotted Tammy's adorable card. 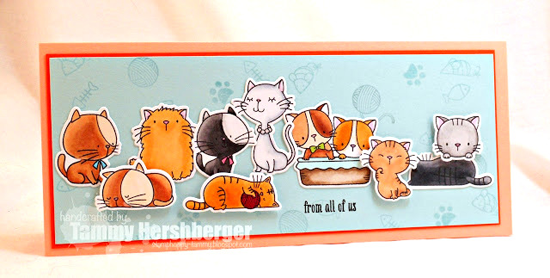 On her blog, Tammy mentions that she created this card for a colleague who was leaving and is a big cat lover. What a GREAT use of our I Knead You and Cool Cat stamp sets! 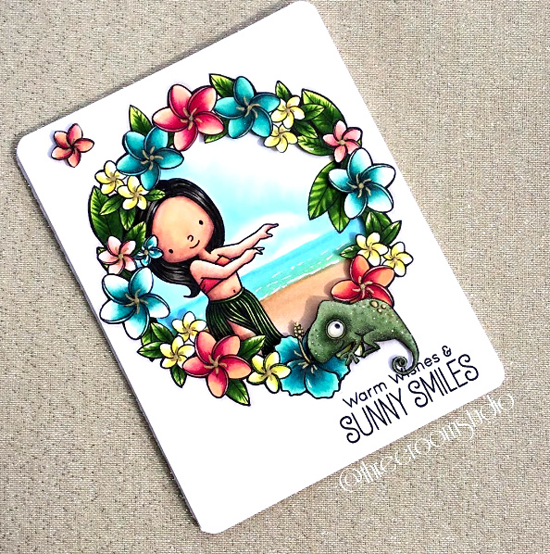 I just love Isha's fresh design using the Pretty Posies and Flashy Florals stamp sets in tandem. Isha says she used the velveteen technique to create her pretty background, and the Stitched Banner Alphabet looks superb in purple glitter, don't you agree? Creative Team Member Joy Taylor spotted this card from Debra James on her blog. Joy says "Sweet little scene using Snuggle Bunnies. I love the watercoloured look on this cuteness of a card." You can't help but smile looking at this happy card. Sandy's card = #coloringgoals. Holy WOW she really makes the Polynesian Paradise come to life with her superb shading and attention to detail. I absolutely love that wreath of tropical flowers! And did you see the water and sand? Phenomenal stuff. MFT Graphics Guru Laina Lamb spotted Laura's project, and what an inventive card it is! 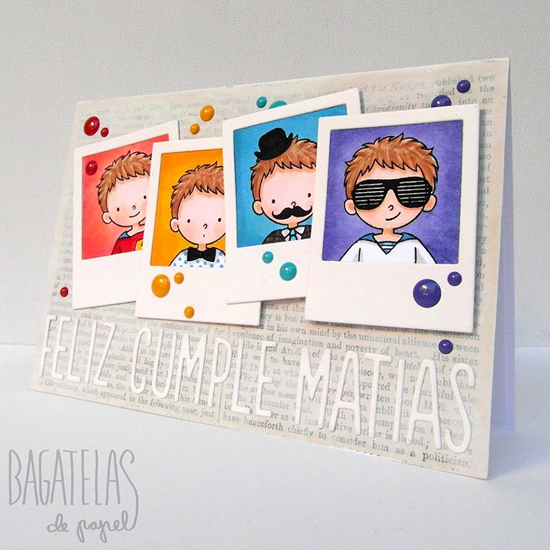 Laura gives our Super Boy four different looks and places him in Precious Polaroids to create a custom birthday card for her son who recently turned five. With our alphabet Die-namics, you can create custom cards that will be cherished for a long time. Thanks for using MFT, ladies! You've left us inspired, and that's what it's all about! See you tomorrow for another great Sketch Challenge, and look for the next MFT Color Challenge Thursday, August 25th. OMGOSH! Day. MADE!!!!!!! Thank you, thank you, thank you for spotting me again!!! I'm honored to be featured with these other fantastic designs... going now to leave them all some love! Thank you, MFT! Wow! All fabulous cards! Congrats to everyone featured here. YAY!!! So honored to have my card in the spotlight :) You just made my day! So many awesome cards here. Thank you Susan and MFT!